I was encouraged by a friend to watch your lecture on Death and the Present Moment at the recent Global Atheist Convention in Melbourne. Your topic is very close to home for me, as I’ve been battling a stage 4 adenocarcinoma of the lung for the past 6 months. I understand it was also especially pertinent for you, and many in your audience, following the death of your good friend, Christopher Hitchens. Your lecture has provoked me to consider a number of issues and to write a few words in response. 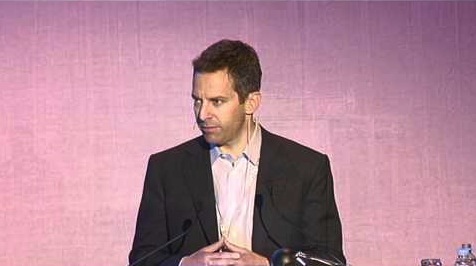 Atheism appears to be a death cult, because we are the only people who admit that death is real. When I heard these words, I had to stop and hit replay. You didn’t really say that, did you? Surely, this is hyperbole for the sake of impact! I’m a theist, not an atheist, and I firmly believe in the reality of death. I’ve visited morgues, been on the scene at fatal accidents, attended funerals, and sat beside lifeless bodies in the hospital. Strangers, friends, and family. No breath, no movement, no heartbeat, no consciousness, no life. I’m not an atheist and yet I affirm that death is very very real. It seems bizarre to claim otherwise. Is there, or is there not, any reasonable evidence for life after death? There may be a number of ways to answer this question, but it would appear to me that a fruitful starting place is the Christian claim that Jesus, the first century carpenter, died and subsequently rose from the dead. I’d start here because Christians base everything on this being true. The claims that Jesus’ body was no longer in the tomb and that he had been seen alive are foundational to Christian beliefs. Scrutinise them, consider the explanations, explore the alternatives, look at the impact on people at the time. Evaluate the counter claims, conspiracy theories, tampering of documents, and challenge the evidence. Public scrutiny and debate are a good thing if they’ll help us get to the truth of the matter. You also seem to assume that religion is all about faith, whereas atheism is all about reason. This assumption needs to be challenged. They’re not opposing pairs. Faith can be based on reason. I’d say that good faith must be based on good reasons. Let me illustrate. I have faith that my wife loves me. Why? Because there is good evidence that this is so. I sit on a chair, showing my faith in the chair to hold my weight, only because it is reasonable. I take a step of faith (trust, dependence, practical belief) because there are good reasons to exercise that faith. Dare I say it, atheism is a step of faith – faith that there is no God and no life after death – based on reasons. What is needed is a non-bigoted, open-mindedness to examine and evaluate the reasons for the faith(s). There is something else that bothered me about your lecture. You seem to divide the world into two belief systems: atheism and religion. This seems reductionist, disingenuous, and deceptive. It is not meaningful to lump together Muslims and Hindus as being the same. They’re both ‘religious’ and they’re both ‘not atheists’, but one believes in only one God and the other believes in many Gods. In fact, you could group Buddhism and Atheism together as ‘non-theism’ and contrast them with Judaism and Islam as ‘theism’. My point is that speaking of ‘religion in contrast to atheism’ simply muddies the waters. It would be much more productive to evaluate the particular claims of different religions alongside the particular claims of atheism. We spend much of life tacitly presuming we’ll live for ever. Death is the clearest evidence that life is finite and yet we live as though it isn’t so. You remind us that we waste a lot of time on trivia when things are ‘normal’. Why else would we watch that hopeless movie for the fourth time?! We care about the wrong things. We regret the things we’ve spent time caring about. You call us to live in the moment. You invite us to explore what’s really worth having and doing. I’m persuaded that the answers to these questions are to be found in knowing God and enjoying the life that God gives us, not by dismissing God and reconstructing a world without him. The death and resurrection of Jesus is evidence to me of what lies ahead. These events in history provide the reasons for my faith. They explain why I’m not religious. That is, I’m someone who has discovered good reasons to put my faith in Jesus, rather than trying to earn my place in heaven (in contrast to many other religions). However, my assurance of a real life beyond death, doesn’t lead me to complacency, but to a renewed urgency and purpose in life here and now. Sometimes I can drift along as though this is not the case, as can we all, so thank you for bringing me to attention once again! As I watched QandA last night on television, I was reminded that Australia is a great country to live in. Professor Richard Dawkins, probably the world’s most famous atheist, debating Cardinal George Pell, head of the Roman Catholic Church in Sydney. Religions in conflict. Worldviews clashing. Freedom to speak your mind. This would never happen in some parts of the world. People are threatened with censorship, imprisonment, beatings, even death if they challenge another’s beliefs. Australia is a great country to live in because we are free to disagree. We are free to argue and persuade and critique and defend our beliefs. May it ever be so. The debate itself left me somewhat disappointed. My chief concern was that Biblical Christianity was not well represented. Cardinal Pell made some curious comments about ‘atheists’ going to heaven, a place of purification for people not ready for heaven, bread and wine turning into the body and blood of Jesus, and the like. 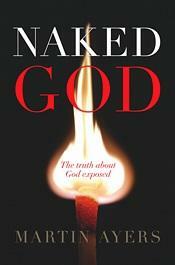 Dawkins was also bemused by Pell’s equivocation about a real Adam and Eve. At times both Pell and Dawkins seemed to argue the case in areas beyond their expertise. Dawkins conceded that he was not a physicist as he sought to explain, in ‘layman’s terms’, how something can be created out of nothing. Pell got drawn into justifying scientific standpoints, when he was clearly unclear about the details. He had obviously done some homework in preparation for the debate, but it reminded me of a student swatting up a few exam questions, knowing they would likely come up. Dawkins was challenged with the ‘why’ question about existence. The question of meaning and purpose. His response was to ridicule the question as a ‘non-question’. At this point he had assumed his conclusion that there is no God. If you postulate a creator God, then the ‘why’ question is very meaningful indeed. As could have been expected, Pell was challenged about his personal views on global warming, about the church’s attitude toward homosexual marriage, and there were snickers when he spoke of ‘preparing boys’ for their first communion. Sadly, religion was pitted against science, on the assumption that faith is incompatible with a scientific worldview. This wasn’t a debate of Christianity versus atheism. It was much murkier than this. My biggest concern was that the very heart of Christian faith was largely ignored in this debate. 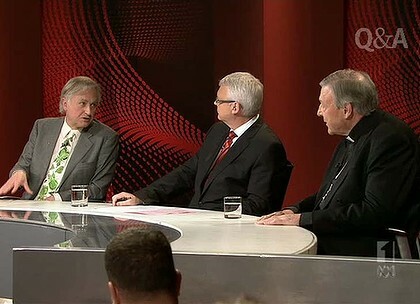 While being promoted as an Easter edition of QandA, the events of Good Friday and Easter Sunday were not properly addressed. Sadly, it was Dawkins, not Pell, who most accurately described the meaning and significance of the cross for Christians. The Cardinal didn’t focus people’s attention on Jesus. The evidence of the empty tomb and the witnesses who claimed to have seen the risen Jesus didn’t rate a mention. All in all, it was most unsatisfying. My hope and prayer is that this debate will stimulate discussion, thinking and investigation. There must be better answers than what we heard last night. What does the Bible actually say? Who was Jesus? How is it that one man has left a mark on billions? Are we simply the product of time plus matter plus chance? Is death really the end? Is there evidence that Jesus rose bodily from the dead? Is there more clarity available?